A of life in Newburyport for over 40 years! This restaurant is a local favorite, offering fresh lobsters,clam chowder, steamers, seafood, prime rib, and other extensive landlubbers choices, daily specials and cocktails in a casual atmosphere overlooking the beautiful Merrimack River. Open year round for lunch & dinner with plenty of free parking. Dine in one of our 5 dining rooms or on the outside deck. Private function rooms, catering & takeout also available. 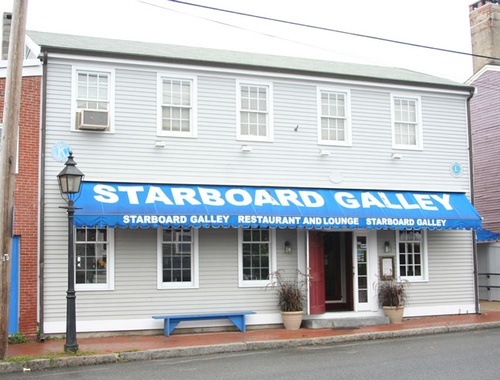 Starboard Galley is proud to offer catering on land or sea. We are a full service caterer and can tailor a menu to suit your needs. Whether it be an after-funeral breakfast, a small family or business gathering, or a large wedding reception, we will help make your function a success. Call David at 978-462-1326 for a menu and to discuss your plans.